This Little Girl Loves Giving Her Golden Retriever A Treat! In the following video, an adorable baby just can’t stop laughing as she feeds her beloved Golden retriever! The cute little girl has her own plate of food, but she decides she’s done and throws little pieces of food to the dog! The pup waits patiently for the treats and when he runs to get it, the baby thinks it’s so funny and starts laughing uncontrollably. 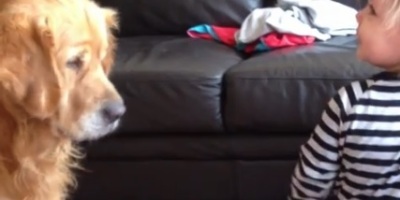 Continue Reading And See This Little Girl Loves Giving Her Golden Retriever A Treat! German Shepherd Adopts Orphaned Opossum And Carries It On Her Back! Adorable Labrador Mix Sees A Sleeping Baby, See What He Does Next!